Push Notification helps you in sending event or alert to your app users even when they are not logged into app. App42 uses GCM (Google Cloud Messaging) to send Push Notification on Android devices. You can send push notification from UI console as well as can use APIs to send and schedule Push notification to your app users. App42 also gives you interesting insight about analytics of push messages too. Here are the few easy steps to get started with an App42 Android Push Notification using a sample project in a few minutes. 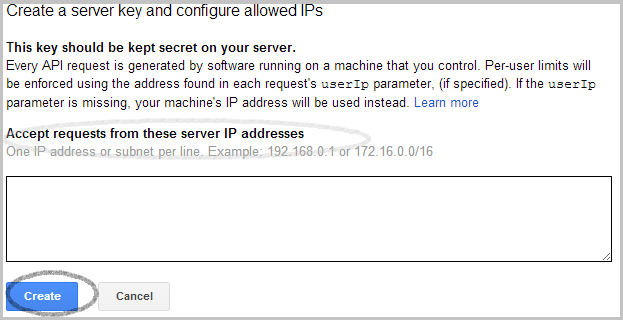 Create a project and get your GCM Project Id from google developer console. It would be available in Overview section of your created project. Select your created project and click on APIs option in Google developer console and enable Google Cloud Messaging for Android service. Click on Credentials from left menu -> Create New Key -> Server Key. 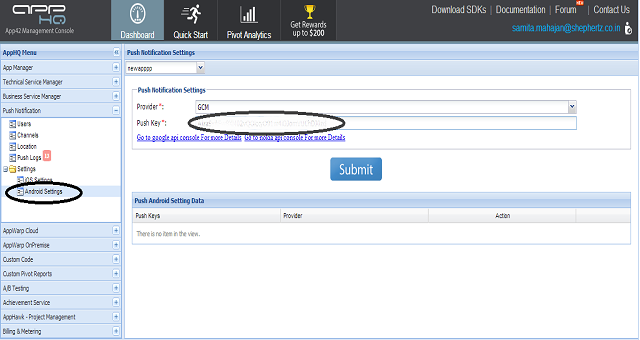 From AppHQ console click on Push Notification and select Android Settings in Settings option. Select your app ,Select the GCM under Provider section and copy server key under push key section which is generated in Google developer console in above step and submit it. To enable GCM support in an Android application you will need to include some additional entries in the AndroidManifest.xml for the project. When you build your project, RAD Studio uses AndroidManifest.template.xml as a template to generate AndroidManifest.xml in the output directory. 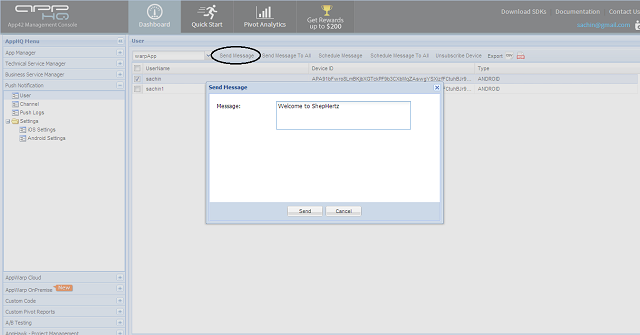 You can also send push messages to your registered app user directly from AppHQ console. To do this, go to AppHQ console and click on Push Notification -> Click on Users -> Select your App -> select your user from table and click on send push button. This will open a pop up to type your message, once you are done click on send button. This will trigger a push notification message to your app user.